Tags: American deaths, Muslim deaths, US-Muslim relations, Why do they hate us? Steven Walt at Foreign Policy has a rather sobering table in a recent article. He seeks to roughly estimate how many Muslims the US has killed and how many Americans Muslims have killed. Even using statistics that favour the US (i.e. 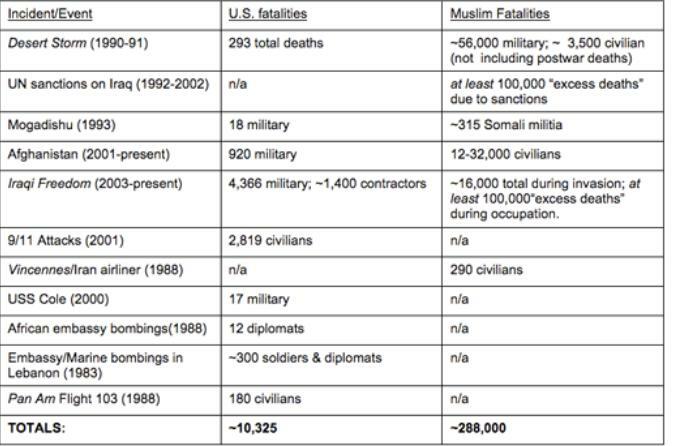 downplay the numbers of Muslims killed) the average is still that for every US citizen killed, around 30 Muslims are killed. There are – of course – many, many caveats to this, which Walt goes over himself. Yet, if noting else, this number is a stark reminder that some/many Muslims do not dislike/hate America because of ‘their freedom’ or some such ridiculous notion, but because of real, stark and deadly facts.